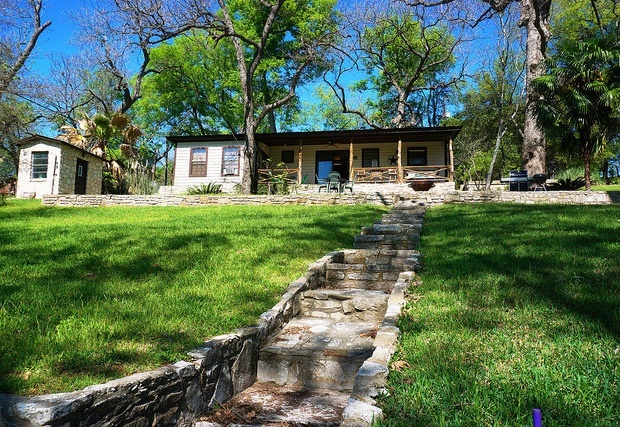 Placed on a hill by the Guadalupe River in New Braunfels, the Pecan Creek Cottage is a great choice for a vacation by the water. The outside of the property features a beautiful deck with plenty of seating for those who want to enjoy the sunshine. There is also a grill and a fire pit that is ideal for kicking back and enjoying a cold beer. The river entrance is a short walk down a set of stone stairs, which means floating and wading is always a readily available option. Inside the house, the Texan chic motif will make you feel right at home. The living room has comfy couches and a flat screen television. Continuing on into the home, the kitchen is ready for a quick breakfast, or a dinnertime feast. The kitchen features a window into the wet bar and lounge complete with a stone fireplace. Whether you’re dining indoors or out, you’ll have a great view of the river. The master bedroom contains a king sized bed complete with a beautiful view of the countryside. The adjoining full bathroom is simple and chic and perfect for relaxing after a busy day on the river. The second bedroom is cozy and homey with a queen sized bed and plenty of natural light. Through a set of French doors, an additional full sized futon can be found for those larger family gatherings. The second bathroom is down the hall and grants an air of feeling light and fresh. If you want to enjoy the river to the fullest extent, the Lone Star Float House is the place to go. There you can rent a tube or a kayak, or commission a shuttle. It is also a bar and grill. 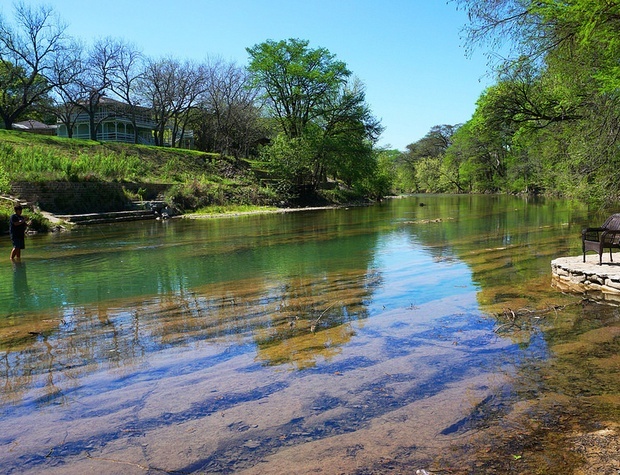 New Braunfels is also home to the Schlitterbahn water park, and the historic Gruene Hall. The Pecan Creek Cottage is but a short distance from these attractions, making it the perfect location for both fun and relaxation.